6-CD box (LP-size) with 52-page book, 148 tracks. Playing time approx. 388 mns. Lester Flatt's RCA recordings are among the finest and most underrated recordings in Bluegrass music. For many years, Lester had been unhappy with Flatt & Scruggs' direction, so after the act dissolved in 1968, he reverted to his first love, traditional music. He recruited a top notch band that included among others Roland White, Marty Stuart, Bobby Osborne, and Josh Graves, and went back to playing the small auditoriums and venues that he and Earl had played at the start of their career. It was a sweet return to basics in every sense. 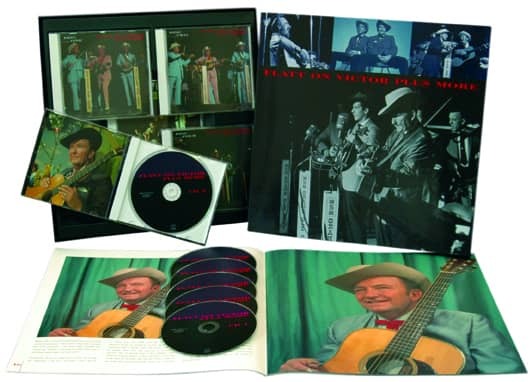 This 6-CD boxed set contains all of Lester's recordings for Columbia and RCA between 1969 and 1974, including his duets with Mac Wiseman, as well as 18 Flatt & Scruggs recordings that could not be located earlier. Here is the complete Vanderbilt Concert from March 19, 1974, with Bill Monroe. The box contains a total of 148 songs. 05 Is Anybody Goin' North To Cincinnati? 01 Have You Come To Say Goodbye? Customer evaluation for "Flatt On Victor Plus More (6-CD)"